While the potential of these new technologies is exciting, a lot of work still needs to be done to customize them to farmers’ needs, and train the future generation in this new data-driven, mechanized agricultural era. WSU plays a big role in tackling that need, from preparing graduates to work in this emerging market to developing technologies and launching companies that match farmer’s needs. With the approaching Precision Farming Expo hosted in Kennewick, Washington, WSU’s Office of Economic Development is producing a mini-blog series to highlight WSU’s role in the regional economic development that results from helping industries advance. To start, here are a few examples of the technologies currently in development at WSU’s Center for Precision and Automated Agricultural Systems, a long-established research and extension center that engages with local farmers, growers and businesses to validate products through research trials, and engineer new technologies and processes. Many of these researchers are working in collaboration with WSU’s Office of Commercialization to go through the steps that will get these innovations from the lab to the market place. 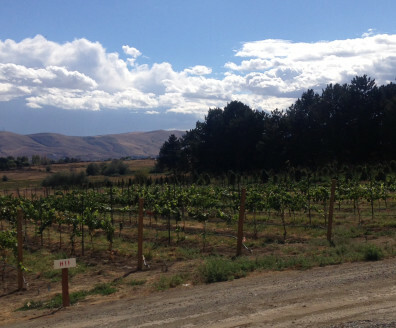 View of vineyards from the new Center from Precision Agriculture and Automated Systems in Prosser. Currently, farmers and plant breeders have to walk through acres of fields to manual inspect and monitor crop health. WSU researchers combine the power of high-tech sensor and camera systems with mechanized platforms to detect plant health characteristics more quickly and accurately than the human eye. Dr. Sindhuja Sankaran and her team are in the early development of this technology which could get new, hardier plant varieties to farmers faster, help farmers detect issues like disease earlier, and monitor the quality of fruit once it is in storage. So far, they have tested the technology in vineyards, and wheat fields, using a range of platforms from tractors to unmanned aerial systems (UAVs). An app developed by WSU engineers and agriculture specialists to help manage irrigation systems is helping farmers in Washington and 10 other states save water and energy. The app, Irrigation Scheduler Mobile, uses data from AgWeatherNet, the robust weather monitoring system developed by WSU researchers, to help farmers determine when and how much their crops need watering. The digital tool adds convenience to farmer’s daily tasks, while also conserving water used on the farm. WSU researchers are developing a robot that is expected to pick apples with the gentleness and speed of a human hand. While mechanical harvesting is already implemented in fruit crops destined for the processing market, apples for fresh market prove a greater challenge because they are easily bruised and time-intensive to pick. As agriculture’s labor workforce continues to decline, mechanizing the harvesting process will become increasingly important. The prototype in development at WSU could become a multi-armed robot that works alongside people in the orchard to pick apples faster with less labor required. 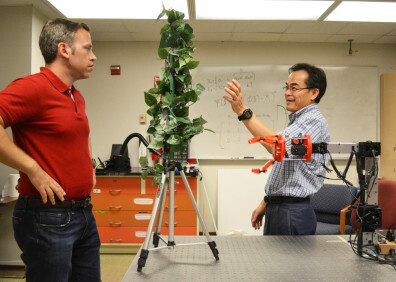 WSU researchers are also developing robotic arms that can shake branches and release cherries to cushioned catching surfaces waiting below. The robotic arms have small cameras, which have been programmed to identify branches to shake. The method is designed for harvesting stemless cherries. 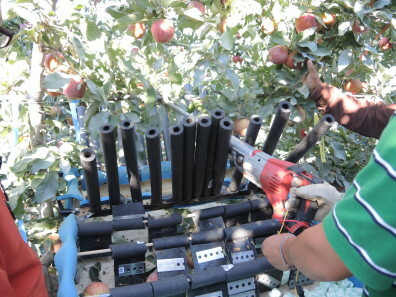 Researchers are also designing and testing possibilities for harvesting apples with this method. Various shake and catch prototypes have been evaluated in the field over the last two years and have shown promise for certain apple cultivars. The bin dog is a robotic, self-propelled fruit bin carrier that will reduce labor requirements and maximize worker productivity. Preliminary research demonstrates that fruit picking could be improved by 50% if the collection bins within harvesting sites could be better managed. The intelligent bin-management system being developed at WSU places collecting bins in the fruit tree orchard, a process that currently requires a human-powered tractor.